Robert James Read (forms list his surname as both Read and Reid) arrived in Canada with his mother prior to the war. He lived with his mother in London and he worked briefly in East Nissouri. In 1915 he enlisted in London. 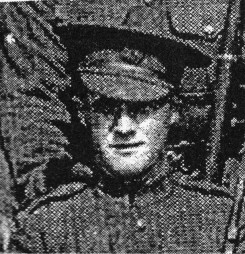 On March 13,1916 his unit sailed to England but he was detained in Quebec and discharged as medically unfit for reasons not recorded in his file. He was very determined and joined a local anglophone militia unit, the 8th Royal Rifles. He re-enrolled in Quebec City with the 244th Canadian Infantry Battalion. It is unclear why he would be allowed to enlist the second time but perhaps the need for manpower caused the Medical Officer to overlook existing problems. The battalion sailed on the SS Lapland on March 28, 1917. During the voyage he came down with the flu. The ship was struck with a mine which caused damage to the ship’s hull. All were ordered to the deck (most in their underclothing). It was bitterly cold and damp and his condition worsened. The ship docked in Liverpool later that day. Read had to be carried to the train station on a stretcher. On April 8, he was admitted to 2 Eastern General Hospital at Brighton with double pneumonia and pleurisy. He failed to improve and died of heart failure on April 15th. It is interesting to note that the second time he enlisted he says he was born in Kintore. Perhaps this was to make his information different from the first time he registered. He is buried in the Brighton Borough Cemetery in England. He was survived by his father Robert James Read of 35 Gifford, Hoxton, London, England and by his mother, Emma Read of Dundas Street, London, Ontario, Canada. -- Courtesy of St. Marys Journal Argus.